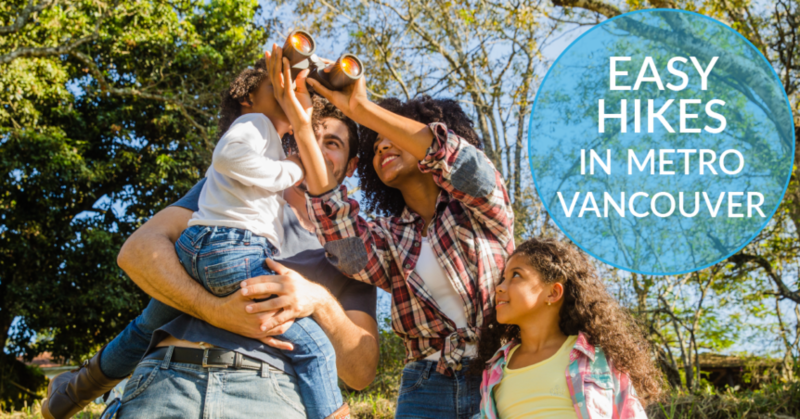 Want to take your little ones on a great hike in Metro Vancouver? We’ve rounded up our favourites that are beautiful and not too challenging for young kids. Get outside and enjoy the great outdoors with these easy hikes in Metro Vancouver. 2 hours and 7 kms of out and back hiking trail with minimal elevation gains, this hike is suitable for babies in carriers, kids 2-5 and 5-8. Ensure you bring appropriate footwear as the trail can be muddy. The Crystal Falls and flowing streams and mossy forest are beautiful pieces of nature your family will appreciate. 2 hours and 5.5 kms of out and back with minimal elevation gains, this hike is suitable for babies in carriers and kids 5-8. With impressive viewpoints and opportunities for camping, this is a great choice for families. Enjoy Gold Creek, the mountains and Gold Creek Falls. Capilano Suspension Bridge takes 45-60 minutes, is 2 kms long loop trail and is suitable for babies in carriers, kids 2-5 and 5-8. The walking is easy, wide trails that are not steep and are mostly flat. There are staircases up to the Treetop Adventure. The suspension bridge itself is 450 feet across. The Treetop Adventure is a series of 7 suspension bridges that take you 100 feet above the forest floor. Lynn Canyon is suitable for babies in carriers, kids 2-5 and 5-8. Lynn Canyon features a suspension bridge and a network of trails such as 30 Foot Pool and Twin Falls. Twin Falls is a one-hour 1.5 km out-and-back trail and is suitable for babies in carriers. This park is forested, has spectacular waterfalls and a beautiful creek. This out and back trail takes 1.25 hours and 3kms. This hike is suitable for babies in carriers and kids 5-8. Given some of the terrain involves tree roots and loose rocks, assess if your 2-5 year old would be able to handle the trail. Mystery Lake is scenic and good for swimming. This out-and-back trail takes 1.5 hours and spans 3.8kms. This hike is suitable for babies in carriers, kids 2-5 and 5-8. It’s a great opportunity to admire Indian Arm and the mountains of Belcarra. Take in the creeks, Douglas Fir and Hemlock trees. This loop trail takes 3 hours to go 8 kms, but the trail can be muddy so make sure to have appropriate footwear. This hike is suitable for babies in carriers, and kids 5-8. Make sure to arrive early as it gets busy in the summer. Given the trail involves stairs, it is not stroller accessible. Enjoy the scenery of the lake from many angles as you make your way around the trail. Explore Burrard Inlet with this 2-hour, out and back 6 km trail with minimal elevation gain. This hike is suitable for babies in carriers, kids 2-5 and 5-8. Stop and enjoy a picnic and navigate the wooden boardwalks towards your next family adventure. This loop takes 3 hours and covers 10 kms. The elevation gain is minimal, making it suitable for babies in carriers and kids 5-8. There are smaller trails nearby for those feeling less ambitious. Be mindful that there are off-leash areas if your kids are nervous around dogs. This loop takes 2 hours and up to 6kms with minimal elevation gains. It is suitable for babies in carriers and kids 2-5 and 5-8. Enjoy old growth Western Red Cedar and Douglas Fir trees and the view of lighthouse. There are great opportunities for picnics. Make sure to use your map to stay oriented.